One day in seventh grade, I carried my red spiral notebook to the median of the big hill near my house. 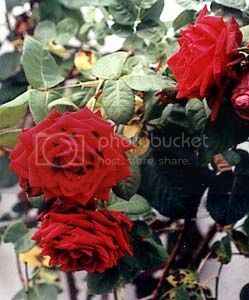 In it grew a garden of red roses among coverbark. I wanted to describe them in my notebook. I had this thing about writing detailed descriptionsâ€”the one I recall best is the description I wrote of my desk in my bedroom. Not a compelling muse for most but perfect for me. On the day of the red rose, I wore a yellow sweater with brown buttons. I chose a place to sit to write. Cars whizzed by, the sun’s rays fingered my back. The roses were ordinary. Nothing overly beautiful, but I was about to change that. I thought I’d turn them into goddesses through my descriptive prose. I twisted to make myself more comfortable when the yarn on the hem caught on a rose’s thorn and my sweater stayed behind while my body turned away. I bent to unhook it when the thorn bit my finger. Instinctively, I pushed my finger into my mouth and tasted blood. This beautiful rose, about to be immortalized, had injured me… all for wanting to write about it. My feelings were hurt. And then, sudden insight! The beautiful rose had thorns. Beauty came at a price. Love and pain comingled. The rose, symbol of love and beauty, did not come trouble-free, risk-free, but was dangerous and had a thorny side as well. The sun overhead seemed especially bright. I felt like I had just unlocked the secret of the world with that revelation. I was certain that I was the first person ever to make that connection, to discover the pain in beauty. I had to write about it! A terribly inadequate poem leaked out of my overfull heart onto the page. I loved it. I felt it. I knew I had claimed space in the universe through my keen insight. I went home. It didn’t take long for me to discover that other poets, lyricists, writers, lovers had already usurped my insight (beating me to it) and had overused it in their own writing. I was crushed. Much later, however, I showed compassion to my junior high self. I realized that I had come to one of the most commonplace metaphors in our language without any help, by way of revelation, by keenly observing and following my wandering thoughts, by discovering beauty and pain because I had discovered them (not because I had been taught to find them). It was an extraordinary momentâ€”to know a thing firsthand can never be considered trite or overused. Truth is like that – new for anyone who discovers it through the lens of personal experience. This entry is filed under Brave Writer Philosophy, General. You can follow any responses to this entry through the RSS 2.0 feed. Both comments and pings are currently closed.